Working the market. Everyone talks about it but how do you really work a market? Who do you target and how much time should you spend selling? As I mentioned in my last blog post on brokers and selling with any distributor, you have to work the market. It’s part of owning your own brand. And, as distributor who used to sell for my family’s brand, I will tell you that I spent most of my time working the market. Here’s a bit of what I’ve learned. My first piece of advice is to start local. Consider where you eat on a regular basis, where your friends or family eat, and promote your brand in those locations. Do you go to the same place every Friday night? Do you belong to a country club? Go there and sell. Another way to stay local is to literally map it out. Circle 20 square miles around your home base and work the market there. Introduce yourself to the person who does the purchasing. If they aren’t there, ask who is best person to contact is. Leave a business card behind. Just know that they don’t want to talk to you about buying a product during the busy lunch or dinner hour. They have customers to serve. You could also stop in during the golden hours of 2pm – 5pm. The next stop is to make appointments, but remember that buyers are very busy. Some restaurants, bars and retailers won’t allow you to just drop in so you should call in advance and see what they prefer. A lot of times they will ask you to make an appointment and that appointment time will be months in advance. Don’t get frustrated. As I said, these are some busy guys and gals. Take the appointment and spend your time preparing for it. Review their beverage list and try to really understand what products they might be in the market for. Come to the appointment prepared. Retailers are a little more open to appointments as they don’t have service to deal with. Remember that retail is 75% of this business and that independent retailers are looking for small production products. Craft, small production is hot right now and they can make money on those products. That should work to your advantage. If you are a winery going into New York, take a trip to NY and build a relationship with the RB&Rs you want to do business with. Follow them on social media and reach out them when planning your trip. In NY, you need a solicitor’s license and LibDib can provide that for you if you are going to taste your wines while there. If selling in CA, you can just taste and sample with the appropriate stickers in place (LibDib is happy to provide you with some!) Place sample stickers on the bottles and you’re good to go in the Golden State. 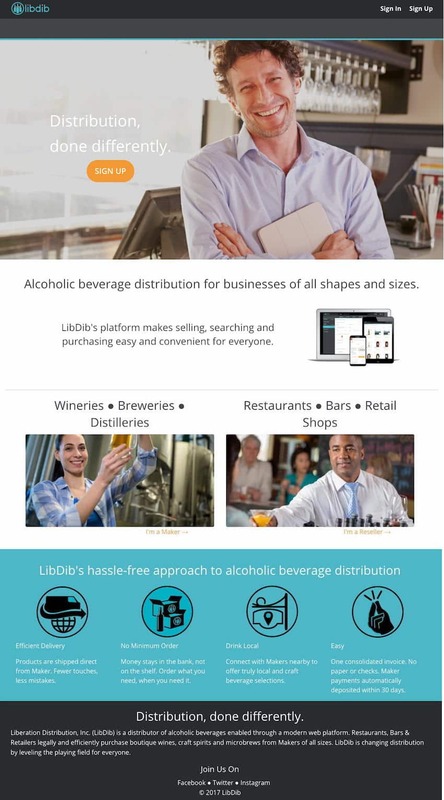 Remember, LibDib is a technology company and a distributor and our amazing engineers work almost around the clock adding new features and making our platform easy for you. We’re less than 6 months old and we’ve accomplished a lot in those few months, but we are always striving to improve our platform. We are also a full-service distributor and can help you out with any questions you may have. Just email us at libdib@libdib.com with any questions or ideas. And, if you have a sales person who wants to be trained on the platform, reach out to us and we can work with you as well. After all, we’re distribution done differently and we can’t change this industry without you the Maker.